With the foregoing as a foundation, we now analyze the application of confidentiality in two death-related situations. 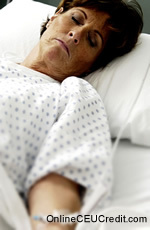 First, we review the application of confidentiality when a client has a terminal illness and expresses a desire to die. Then we turn to confidentiality after a death—by whatever means—has occurred. Although therapists providing services to clients with the HIV disease have been attentive to end-of-life issues and decisions (e.g., Kain, 1996), there has been limited discussion in the rest of the literature on the roles of mental health professionals when working with clients who are dying. However, this is changing, with several articles appearing recently in this journal (e.g., Werth, 1999) and a few others, and with the publication of a policy statement from the National Association of Social Workers (NASW, 1994) and the reports from the American Psychological Association's (APA's) first two working groups on end-of-life decisions (Farberman, 1997; Working Group on Assisted Suicide and End-of-Life Decisions, 2000). Many of these publications have examined the issue of confidentiality. This section reviews the conclusions of the individuals and groups that have discussed the ethical and legal issues associated with confidentiality when working with clients who are dying; discuss the empirical research done on psychologists' and other mental health professionals' attitudes about their obligations in these situations; and highlight how the informed consent process can accommodate the data on ethics, laws, and attitudes. We want to emphasize that although much of the focus has been on assisted suicide, the discussion that follows relates to terminally ill clients who have a desire to die and are considering any option that may affect the timing and manner of death (e.g., withholding or withdrawing life-sustaining treatment as well as assisted suicide). Ethics. The ethical responsibilities of mental health professionals working with clients who are dying have been examined by a variety of individuals and groups, and there are discrepancies in the conclusions of these commentators. The most common and detailed analyses have related to psychologists. For example, Peruzzi, Canapary, and Bongar (1996) discussed the roles of psychologists when working with a client who is considering assisted suicide, and they concluded that the APA ethics code (1992) mandates breaking confidentiality when a client is perceived to be at risk of harming himself or herself. Abeles and Barlev (1999) cited Peruzzi and colleagues' conclusion with approval. However, in an article reviewing the ethical codes and the public statements about end-of-life issues of the major mental health organizations, Werth (1999) stated that the APA (1992) ethics code does not require breaking confidentiality when a client wants to hasten his or her death through assisted suicide (see also Barret, Kitchener, & Burris, 2001). Werth (1999) even said that psychologists have more leeway than most mental health professionals in the courses of action they can take in these situations, and he provided a set of practice guidelines that he claimed fit within the codes of ethics of the APA and the other mental health organizations. Although their statement (Farberman, 1997) did not create official APA policy, the first working group on assisted suicide and end-of-life decisions of the APA appeared to take the position that a psychologist does not have an obligation to break confidentiality when a client wants to hasten death in any way, including assisted suicide. In fact, the group said that the psychologist's role in such situations is to protect the client's rights, support significant others, not allow the affixation of a mental illness diagnosis if it is inappropriate, and help evaluate whether or not the client has decision-making capacity. The APA's second working group on end-of-life decisions recommended that the organization take a position that neither endorses nor opposes assisted suicide (Working Group on Assisted Suicide and End-of-Life Decisions, 2000). The group's proposed resolution indicated that it did not believe a psychologist has a mandate to break confidentiality in situations involving assisted suicide. Specifically, it called for the APA to help provide direction for psychologists who have clients considering assisted suicide and other end-of-life decisions. After much debate, and with only minor revisions, the proposed resolution (along with a more general resolution on improving end-of-life care for adults) was passed by the APA Council of Representatives in early 2001 (Thomas, 2001), meaning that the APA is now on record, like the NASW (1994), with official statements about the appropriate roles of members in end-of-life situations. Thus, although some have argued otherwise, the most thorough analyses of the APA ethics code (1992) and the statements by the first two APA groups on assisted suicide and end-of-life decisions indicate that a psychologist does not have an ethical obligation to break confidentiality if a client who is dying is considering taking action that may end his or her life. Law. Ethical and legal behavior are not synonymous. One can be within the letter of the law and still be unethical. The current ethics code for psychologists (APA, 1992) states, "Psychologists disclose confidential information without the consent of the individual only as mandated by law" (5.05a). Because similar provisions are present for other mental health professionals, a therapist may also be forced to violate an ethical principle to comply with the law. To examine whether this is the case in regard to end-of-life issues, Werth (1999) also discussed, along with his analysis of ethical codes, the legal requirements of psychologists and other mental health professionals when working with a client who wants to hasten death. In a follow-up study (Werth, 2001), he demonstrated that state laws require harm to self to be the result of a documentable mental illness before a person could be considered eligible for involuntary hospitalization. Further, only a handful of states require an attempt at hospitalization when a mental health professional deems a client to be at risk of self-harm as a result of mental illness. In 48 states, such an intervention is allowed but not required. This finding regarding state statutes and involuntary hospitalization parallels the Bellah v. Greenson (1978) decision in California, in which the court stated that a therapist has a duty to take some action when a client is determined to be at risk of self-harm but declined to say what should be done. In the case, the plaintiffs contended that under Tarasoff(1976), the psychiatrist treating their daughter had a duty to warn them of her "suicidality". The court expressly refused to extend Tarasoff requirements to situations involving harm to self. Further, the court noted that Tarasoff required a "duty to protect" not a "duty to warn." The court said that whether a therapist's intervention to protect the client was acceptable should be determined based on the norms of the therapeutic community. The reasoning in Bellah has not been contradicted by more recent decisions. Although there is a requirement to do something when a client is considering taking some action that may result in death, there is not an automatic legal obligation to break confidentiality or to attempt to involuntarily hospitalize the client (see also Barret et al., 2001). The intervention by the therapist merely needs to comport with an action that would be acceptable according to other professionals (i.e., comport with the standards of care). Because of the importance of the perspective of colleagues, the attitudes and experiences of mental health professionals in situations where a client is perceived to be at risk of self-harm are important. The preceding section contained information about ethical obligations in social research. Write three case study examples regarding how you might use the content of this section in your practice.